This is a large oval container with twist up mechanism and natural colour. 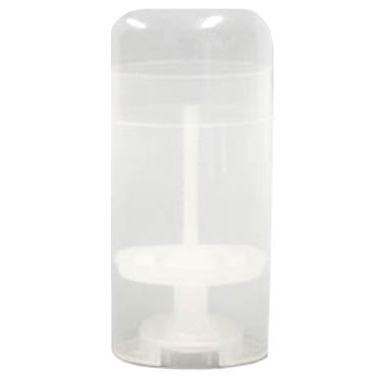 It comes with an inner dome to keep your product clean and to prevent drying and shrinkage of the product. It can be used not only for deodorants but also to pack your lotion bars, foot bars, body butters etc. Love these. They are the perfect size as I make my own deodorant. The price is the best I've found. Love these! They work so well for deodorant! The lids sometimes are hard to get on, but otherwise nothing but great things to say about these containers! So happy that well has these. I started making my own deodorant and they work great. I'm sure they would be good for lotion sticks as well. I really like these for making lotion bars. Great product. These are perfect for my pain relief lotion bars and homemade deodorant sticks. The lids fit nicely so I don't have to worry about them falling off.